3D-rendered computed tomography, showing splenic vein at upper right. The splenic vein (formerly the lienal vein) is a blood vessel that drains blood from the spleen, the stomach fundus and part of the pancreas. It is part of the hepatic portal system. The splenic vein is formed when several smaller collectors leaving the spleen join shortly thereafter. It follows a course superior to the pancreas, alongside the splenic artery. It collects branches from the stomach and pancreas, and most notably from the large intestine (also drained by the superior mesenteric vein) via the inferior mesenteric vein, which drains in the splenic vein shortly before the origin of the hepatic portal vein. 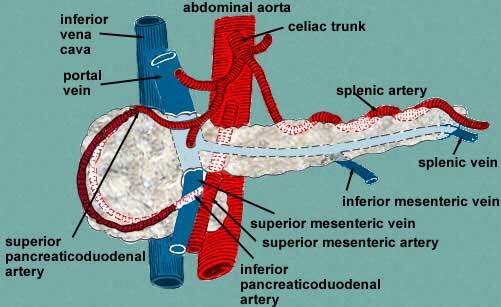 The portal vein is formed when the splenic vein joins the superior mesenteric vein. The splenic vein is subject to vein thrombosis, presenting some of the characteristics of portal vein thrombosis and portal hypertension, but localized to part of the territory drained by the splenic vein. These include varices in the stomach wall due to hypertension in the short gastric veins and abdominal pain. This results in gastric varices, in which the treatment of choice would be splenectomy. The most common cause for splenic vein thrombosis is both chronic and acute pancreatitis. ^ Simpson WG, Schwartz RW, Strodel WE (1990). "Splenic vein thrombosis". Southern Medical Journal. 83 (4): 417–421. doi:10.1097/00007611-199004000-00014. PMID 2181690. ^ Butler JR, Eckert GJ, Zyromski NJ, Leonardi MJ, Lillemoe KD, Howard TJ (2011). "Natural history of pancreatitis-induced splenic vein thrombosis: a systematic review and meta-analysis of its incidence and rate of gastrointestinal bleeding". HPB. 13 (12): 839–845. doi:10.1111/j.1477-2574.2011.00375.x. PMC 3244622. PMID 22081918. Gray's s278 - "The Spleen"